Tandem Skydiving Experience at Shropshire's Tilstock Airfield - jumping from 10,000ft at the closest airfield to Manchester, Crewe, Birmingham & Stoke to experience 30 extreme seconds of free fall! 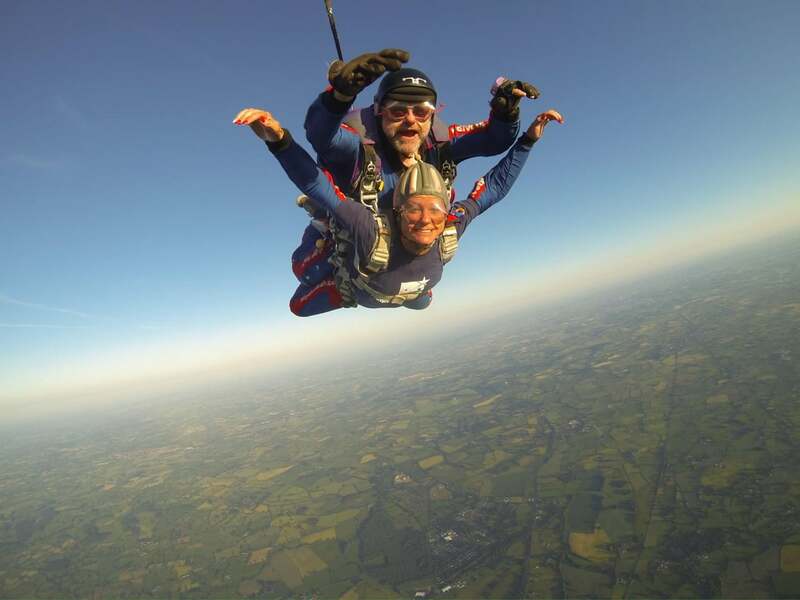 Tandem skydiving in Shropshire is perfect for extreme adrenaline junkies, as the West Midlands' main airfield is also the closest to Manchester, Chester, Birmingham, Stoke & Crewe - providing the most exciting of free falling thrills for the middle of the country. With an experienced instructor strapped to your back and controlling every aspect of the jump, you'll be free to enjoy the spectacular sensation of free fall as you hurtle toward ground at 120mph! Once you've landed, you can cross one off the bucket list and never forget the day that you did your first tandem skydive!Your tandem skydive in Shropshire will begin with a welcome to Tilstock Airfield, where you'll sign the registration documents and move straight into the classroom for a safety and technique brief. Once you've watched the video and spoken with the instructor, you'll move to the practice mats for a practical lesson in where to tuck your head and place your limbs throughout the jump. Next, you'll be ready to dress in the safety gear - before making your way to the runway to be strapped to your instructor and flown up to a height of 10,000ft. Once at the desired jump height, the instructor at the front of the queue will open the hatch on the side of the plane and begin the first of the descents! One by one, skydivers will shuffle up to the open door, dangle the legs over the edge before rolling out into the great open! With incredible views of the ground below, and around 30 seconds of intense free fall as you hurtle toward the ground at terminal velocity - you'll be experiencing the most incredible adrenaline rush of your life before the instructor deploys the parachute at around 5,000ft, where you'll begin a 5-6 minute open canopied float back to ground level. Once landed, you'll remove the safety equipment and be free to go home with a certificate and the memories of the most extreme journey you may ever take. Tandem skydive experiences in Shropshire are available from mid January to mid December, on Fridays, Saturdays and Bank Holidays. Maximum Weight: 15 Stone with no leeway. Your weight must be in line with your height - Please check the BPA form prior to purchasing to check that you meet these requirements. You can check this here. Maximum Age: 70 - restrictions based purely on health. Tandem skydives with The Parachute Centre can take up to a whole day. While the jump itself should take around 35 minutes to complete, with 25 minutes to get up to 10,000ft - around 30 seconds of free fall - and around 5-6 minutes of open canopy floating back to terra firma. Whilst it is possible to be in an and out in an hour, we advise allowing the whole day for your skydive, as the weather conditions on the day and the time of flight your jump is booked for will have a huge affect on the timing. Participants: The Shropshire Tandem Skydive is for 1 participant. Friends and family are of course welcome to watch your unforgettable parachuting experience at Whitchurch's Tilstock Airfield, but numbers are generally restricted to a few spectators per jumper. All visitors are encouraged to bring cameras with them, as the excitement etched onto parachutist's faces both pre and post jump is worth capturing! Anges café is an onsite canteen serving hot food and drinks throughout skydiving hours, which is a welcome respite for cold spectators standing around all day! Group bookings are welcome, although there is a maximum size of ten people. Three skydivers can be lifted at one time, in one plane, so you can experience Skydiving together. Clothes that you feel comfortable in are best for skydiving at Shropshire's Tilstock Airfield, as you'll be wearing the safety equipment supplied by The Parachute Centre. This will include a full length jump suit, a cap, goggles and gloves. It is advisable to wrap up warm on the cold winter months, as standing around at the airfield can be very chilly indeed - and the temperature at 10,000ft can take your breath away! Shropshire skydiving experiences are weather dependent. If the wind, rain or even snow conditions are too strong - or if the visibility of the ground is poor from 10,000ft - you may have to wait around a bit at the airfield for it to clear up. If the weather conditions are not going to clear on the day, your skydive will be rescheduled for a more convenient date. What a fantastic day, and because I had it filmed, I will be able to relive it time, and time again. It was an amazing experience, very exhilarating, awesome! As somebody who is terrified of heights it was a real challenge for me but it's not like you imagine it to be - enjoy it :) The Staff were all very friendly and professional. Highly recommended. Hello Tandem skydive experiences in Shropshire are available from mid January to mid December, on Fridays, Saturdays and Bank Holidays.